Sadly,Charlie Ward of the United States Muay Thai Association (USMTA) has passed away. Charlie Ward was noted for the Arizona State University program he started dedicated to Muay Thai, close combat techniques and MMA. The USMTA wishes to express its sincere condolences to the family and friends of the late ‘Professor’ Charlie Ward. USMTA AZ State Director for many years, a personal friend and a mentor to many. USA Martial Arts Hall of Famer. Professor & Master Instructor of Martial Arts Studies, Exercise Science, and Comparative Religion & Culture. Author/Writer. Retired Professional Fighter. Chief Master Instructor/Trainer and Kru, Charlie Ward is a highly respected martial artist, fighter and coach. He has studied martial arts for over 33 years, and is ranked, with teaching certifications, in multiple art forms. Charlie specializes in Muay Thai, Boxing, and Tai’kor CQC (Close Quarter Combat). He also has a strong background in Pankration, Tactical Grappling and Arnis/Escrima Stick Fighting. 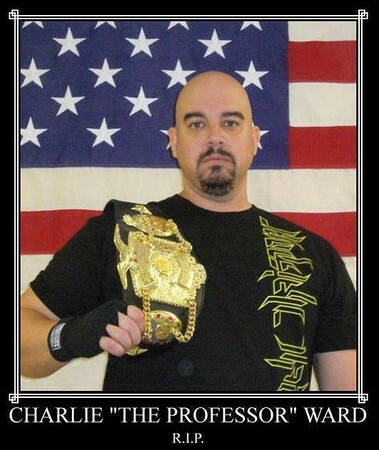 Known as the MMA Professor, Charlie teaches accredited MMA and Muay Thai classes at Arizona State University. Currently, his is the only program in the country where students can receive college credits for studying Mixed Martial Arts and Muay Thai. The friends and colleagues that Charlie has trained and fought with over the years were practicing MMA before MMA was ever a technical term. He has witnessed, and been a part of, the evolution of this sport and training style since its inception. In 2007 he became the United States Muay Thai Association, Arizona State Director. ~ by fatsoking on December 21, 2010.